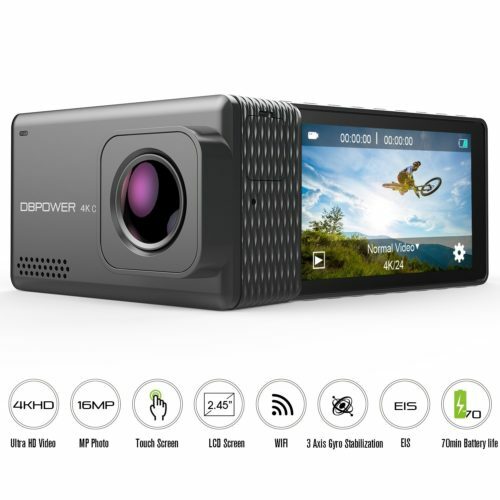 Large 2.31-inch LCD Touchscreen: The Built-in 2.31″ touchscreen for easy preview and shooting, DBPOWER 4K action camera is highly recognized for its stylish, yet solid appearance. 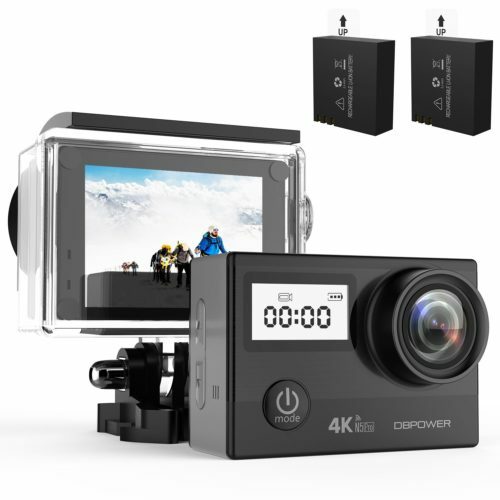 DBPOWER N6 4K Action Camera is an ideal digital camera that is well-suited for travelling and perfect for outdoor sports, like gliding, surfing, diving, skiing, snorkeling, climbing, biking and driving. 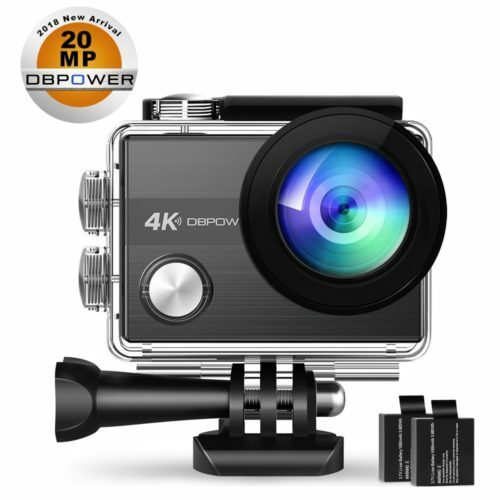 DBPOWER 4K Sports Camera is one of the most easy-to-use cameras. 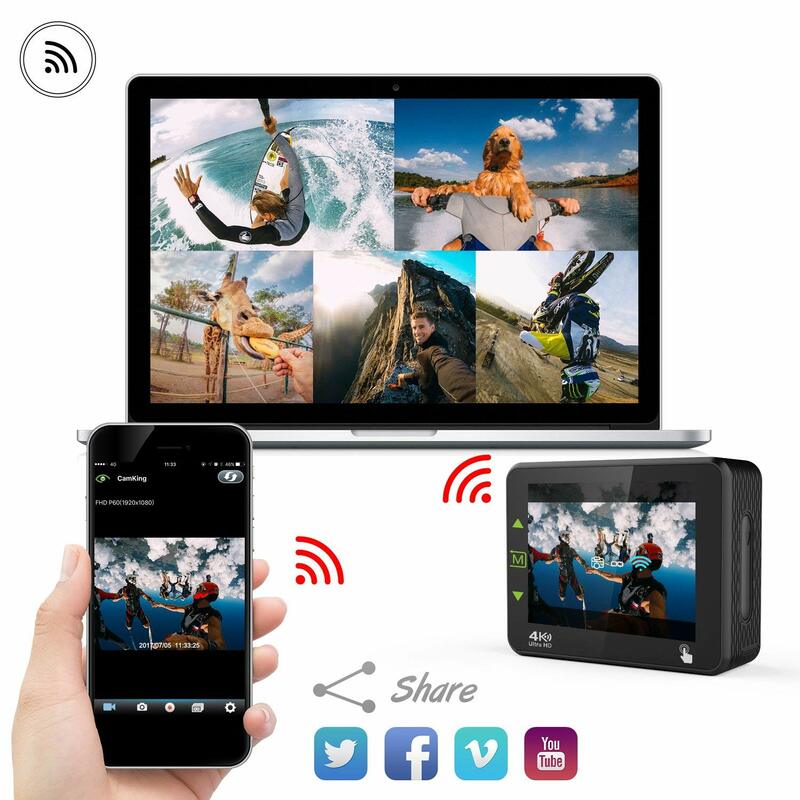 Thanks to its 2.31-inch touchscreen, it is very easy to preview and playback your shots or change settings.It has a sleek appearance and is perfectly sized making it both portable and mountable. 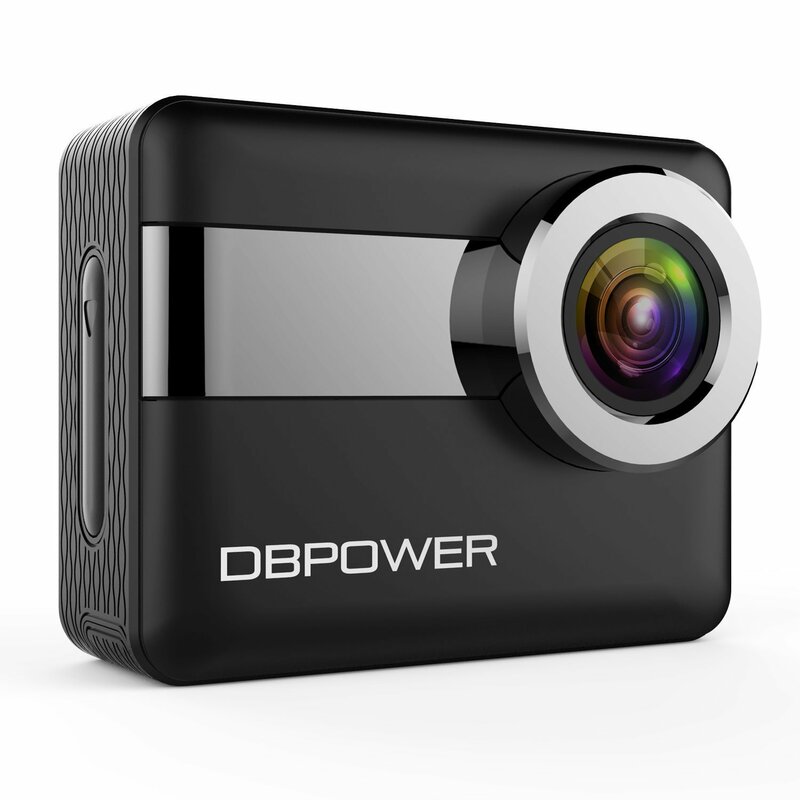 DBPOWER 4K Action Cam can work with GoPro mounts. 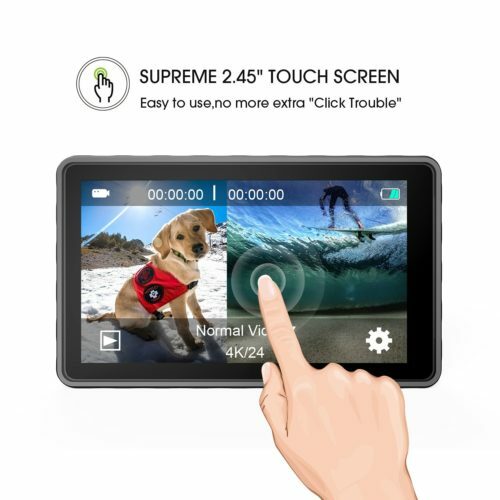 Large 2.31″ touchscreen is convenient and fun for you to preview and play back your shots, change settings. Designed with Gorrilla Glass to resist scratches and daily impact. 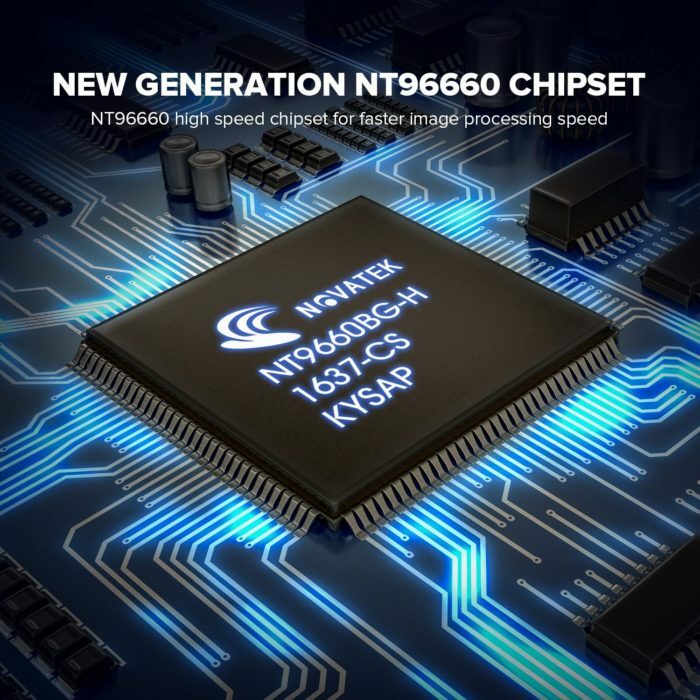 Built-in Electronic image stabilization detects position and motion change. When the camera moves, shakes or experiences impact, the camera can capture stunningly amooth videos. 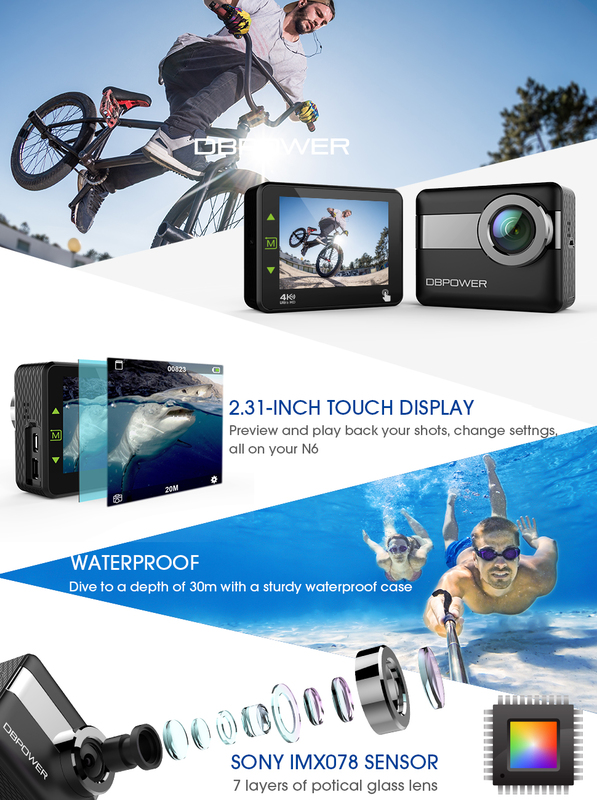 Dive up to 30 meters(90 feet), DBPOWER N6 comes with a very sleek and sturdy waterproof case. 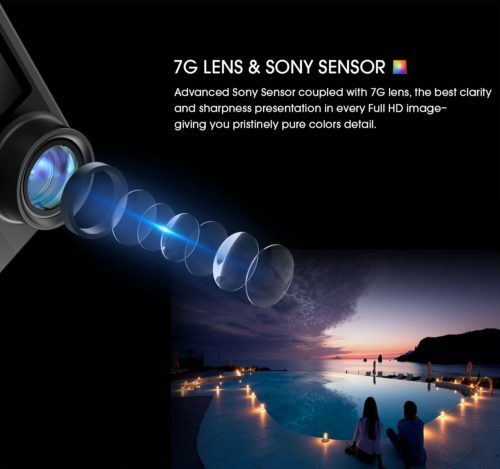 170° wide-angle with 7 layers of optical glass lens to expand your horizons, you won’t miss the perfect shot. 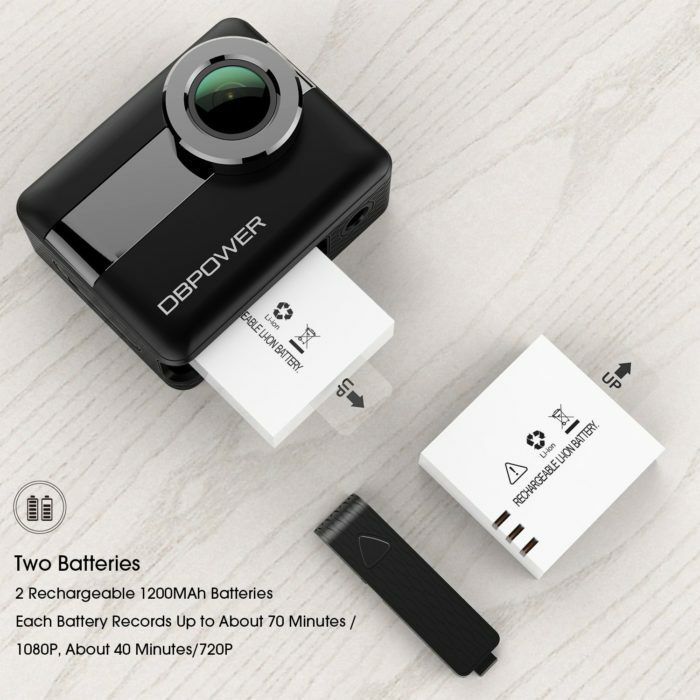 DBPOWER N6 has a 20 mega pixel sensor for shooting crisp photos and recording amazing 4K videos. Capture life in whole new way with 15 accessories, and all the accessories can work with GoPro mounts. 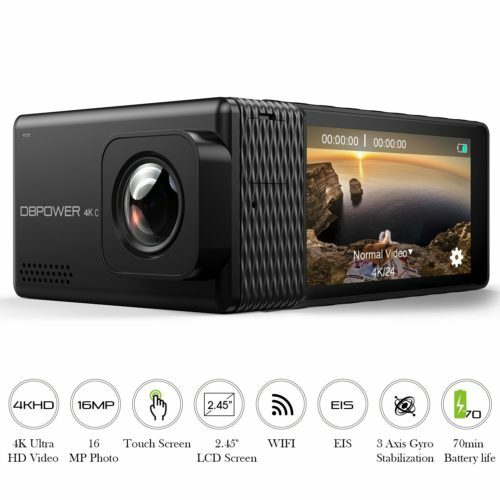 Question: Can this be used as a Dash cam? Yes. it is used for car. but i thinks it used on sport activity will better. Question: is the USB slot a mini one or a micro one? Answer: Hi there, the USB slot of this camera is a Mini one. Please note that regular micro usb cable can not fit in this camera. 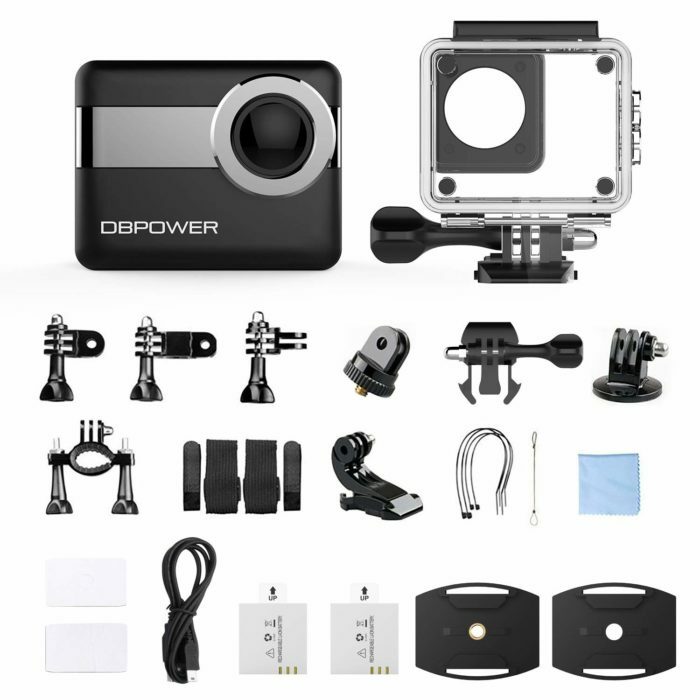 Question: Does it fit gopro mounts? 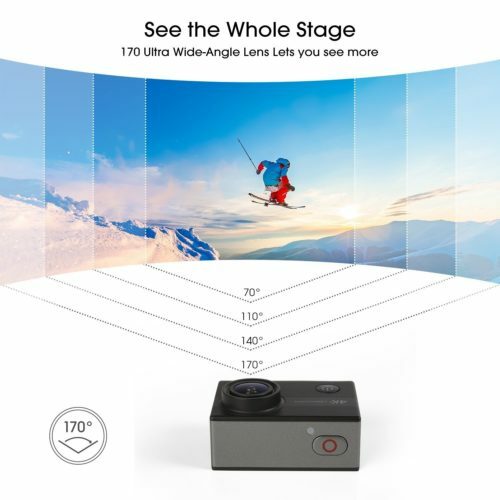 Question: GoPro quality sensor , lens, chipset , reliability? Answer: Video quality is quite good and better than I expected for the cost of the camera. The sound quality could be better. Reliability has been very good and Im happy with the purchase. 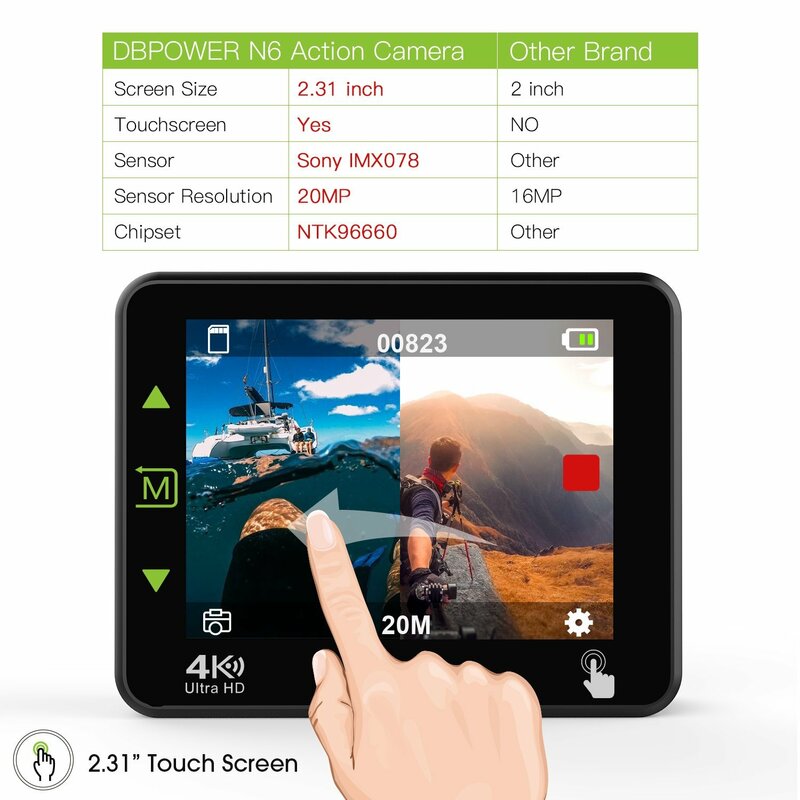 Question: Can you have it record when it detects motion? Answer: Yes, You need to turn on the motion detection setting. Turn camera on then in lower right hand corner go into settings. Second Screen 1st icon (running person) select and turn on motion detection. Question: Is there a charger for the battery? Question: does it come with the accessories advertised? Answer: Its wifi, as long as the tablet can download the app i don’t see why not. Question: What’s the max capacity of micro SD card does it use? Question: How long is the video recording time? Answer: It depends on two things, the size of your storage SIM and how good the batteries are. We recently visited Niagra Falls and this camera performed amazingly. I got well over an hours worth of recording time in 4k UHF out of each battery. I highly recommend this camera.